The trace mineral, zinc is essential for the growth and metabolism of cells, supporting DNA replication, transcription to RNA as well as protein synthesis. *1 Inadequate dietary intake of foods rich in zinc (oysters and organ meats are the highest) or ingesting foods which may inhibit the absorption (phytates, oxalates, and some polyphenols). Drug-induced nutrients depletions may also be of concern. 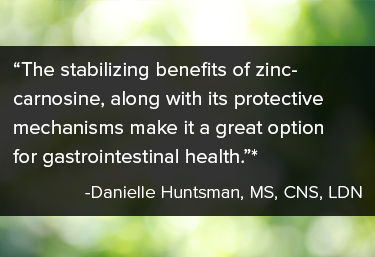 The use of zinc-carnosine has a place in many different protocols due to its benefits in maintaining a healthy mucosal integrity and protective effect on the epithelial barrier. * Zinc as a single intervention has been shown to support intestinal barrier function. *4 The use of zinc-carnosine supports small intestinal mucosal integrity. * A 2007 trial evaluated zinc-carnosine in both animal and humans. In the animal portion of the study, a 50% reduction in villus shortening after a trial use of zinc-carnosine was reported. *5 The human portion of the study was a double-blind randomized controlled crossover trial. Healthy volunteers took 37.5 mg twice daily or placebo; the results showed zinc carnosine to have a protective effect within the small intestine. Another study of interest looked at the benefit of zinc-carnosine and post-exercise recovery*, a topic of importance for athletes. The results of the 14 day, double-blind, placebo-controlled study showed the use of zinc-carnosine to be beneficial in supporting epithelial resistance post exercise. *6 It is helpful to note that endurance exercise is a common model to measure intestinal permeability. Stefanidou M, Maravelias C, Dona A, Spiliopoulou C. Zinc: a multipurpose trace element. Arch Toxicol. 2006;80:1–9. Matsukura T, Tanaka H. Applicability of zinc complex of L-carnosine for medical use. Biochemistry (Mosc). 2000 Jul;65(7);817-23. Furuta S, Toyama S, Miwa M, et al. Residence time of polaprezinc (zinc L-carnosine complex) in the rat stomach and adhesiveness to ulcerous sites. Jpn J Pharmacol. 1995 Apr;67(4);271-8. Sturniolo GC, Fries W, Mazzon E, Di Leo V, Barollo M, D'inca R. Effect of zinc supplementation on intestinal permeability in experimental colitis. J Lab Clin Med. 2002. 139: 311–5. Mahmood, A. F. Zinc Carnosine, a health food supplement that stabilises small bowel integrity and stimulates gut repair processes. Gut. 2002.56, 168-175. Davison G, Marchbank T, March DS, Thatcher R, Playford RJ. Zinc carnosine works with bovine colostrum in truncating heavy exercise-induced increase in gut permeability in healthy volunteers. Am J Clin Nutr. 2016 Aug;104(2):526-36. Tan B, Luo H-Q, Xu H, et al. Polaprezinc combined with clarithromycin-based triple therapy for Helicobacter pylori-associated gastritis: A prospective, multicenter, randomized clinical trial. Green J, ed. PLoS ONE. 2017;12(4):e0175625. doi:10.1371/journal.pone.0175625. Miyoshi A, Matsuo H, Miwa T, Nakazima M. Jpn Pharmacol Ther. 1992a;20(1);181-97.